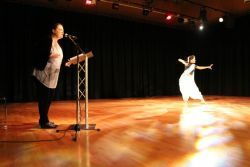 At my first performance I stood on tiptoes to reach the microphone (rather than simply adjusting it), teetered and hit myself in the face with it, before reading my poem out nervously from a much-thumbed sheet of paper that trembled in a terrified hand. Thankfully that was a loooong time ago and I'm now an old hand. I adore performing and the bigger the audience, the better the buzz. I'm happy to do charity performances for nothing other than expenses, when I'm well enough. The photo shows me performing at the MAC Arts Centre in Birmingham at the 'Inspired by Tagore' book launch, accompanied by the excellent dancer Shuma Pal. It was a wonderful night of dance, words and music, and at the end I was presented with a cheque for winning the competition. A rare night of creative artistry and being thoroughly spoiled. The usual format is for me to do anything from a ten minute to an hour slot, but I can do other sets and I'm open to any interesting writing or performance projects. Check the News section for details of upcoming events, or if you'd like to invite me to something then email me.